description: The form of the project refers to the commemoration of the undoubtedly outstanding figure of the writer of German-Kashubian nationality - Günter Grass. The project symbolically refers to the social and cultural identity of the writer, whose exemplification is his work. 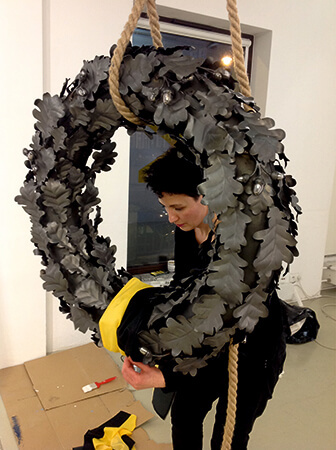 I suggest the implementation of a steel rim with stylized oak leaves cut from steel sheet. The motif of acorns and twigs of oak appears in the royal and knight coats of arms since the Middle Ages. It was also used in uniforms emblems. It was a symbol of strength, nobility and fame. It was used especially in Germanic military symbolism, to which the German armies willingly made reference. 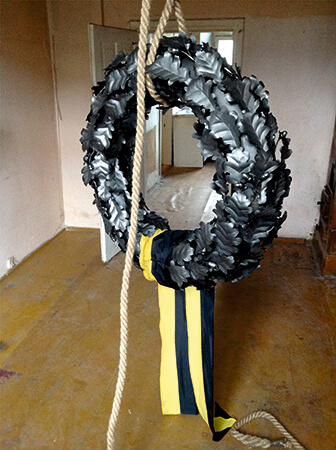 A long paper band in black and yellow color will be wound on a steel wreath - as a reference to Grass's Kashubian roots. The idea of the project is identical to the words of another German writer, Martin Pollack, who has been studying national as well as his own dramatic identity for many years. 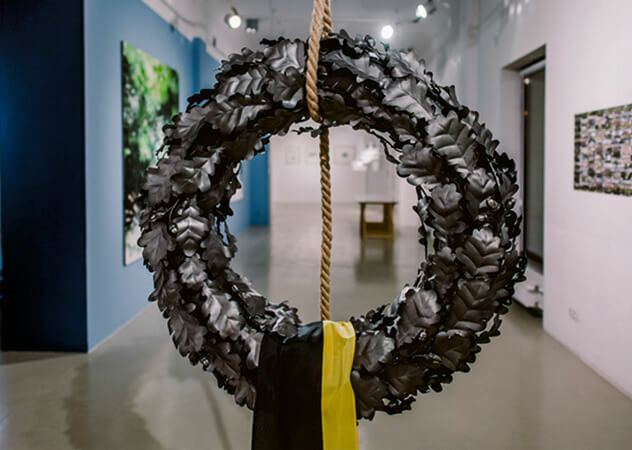 In his latest book, Topography of Memory, he exposes historical narrations about topics: repressing the memory of crime, inheriting guilt, investigating invisible places of execution, which are marked in whole Eastern Europe. Studying the history - your own, but also someone else's, without any prejudices, is the most important condition for understanding yourself, finding your own identity - and meeting the Other on an equal level. Without history, it can not be done. We must never be tempted to want to throw over the national narratives overboard, to erase them from the memory, because we are afraid that when we confront them, they can spoil something, become an obstacle. Everything must be said, written down, even if it can still be painful today. All stories must be told, one must not be silent about any tragedy. However, we must constantly remember to not lose sight of our goal, which is to understand the Others, accepting them as they are, with all the weight of their history.